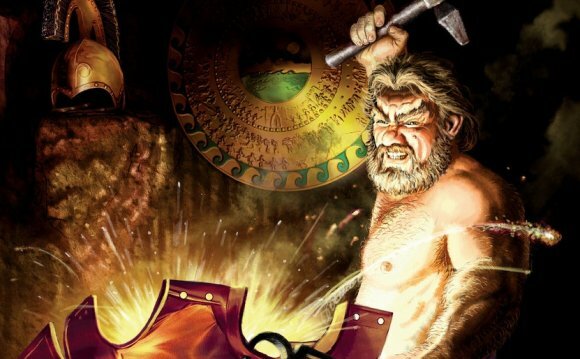 Norse gods didn't have a "smith" god (like the Greek god Hephaestus or his Roman counterpart Vulcan). In spite of being polytheists they didn't divide every aspect of their lives in the way that other cultures (Greek, Roman) did. In Norse mythology most of the "cool crafts" where done by the Dwarfs (Dwarves). There are though "legendary" smith figures in the Norse mythology beside the Dwarfs, like Waylan the Smith. Wayland (sometimes Weyland or Weiland) is, according to Völundarkviða (a poem in the Poetic Edda), one of the three sons of the king of the Finns. But, in spite of being a legendary master blacksmith, he didn't forge any remarkable artifacts nor any of the god's weapons. He is also a human figure (although maybe with skills that could rival with those of the Dwarves) not a god.